Ackermann’s Repository of Arts, November 1816. 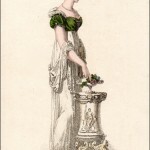 This is the period in which the waistlines are extremely high and the bodices quite small. 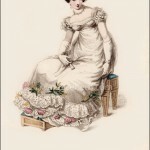 Also at this time, the bottom half of skirts were often filled with extravagant flounces and trimmings. 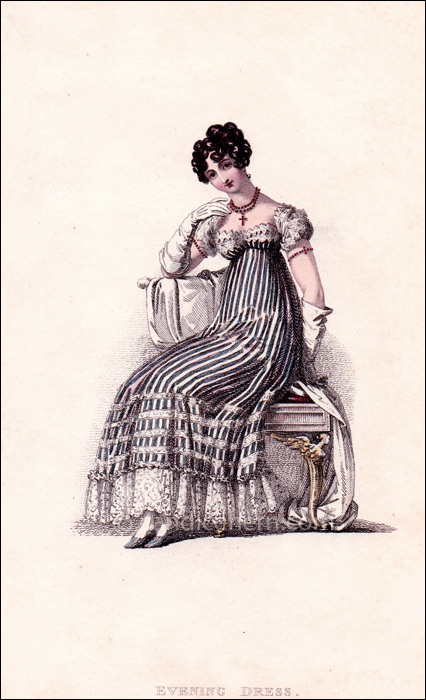 Here, however, the ornamentation of the skirt is quite understated and relatively simple. 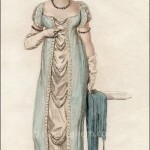 Note the looseness of the gloves, which is typical of the entire Regency period. Also notice the armlets worn high on the upper arm. Always worn in pairs, armlets were also very typical of the period.